With 12 minutes left in the game, it looked like the Seattle Seahawks had the Washington Redskins right where they wanted them. After allowing the Redskins to rack up nearly as many yards in the first quarter as the Rams had against Seattle in an entire game, the Seahawks defense tightened up as the offense scored 17 unanswered points. Up 17-7, the defense had seemingly figured out the Redskins offense and was getting pressure on quarterback Rex Grossman. Down two scores, it looked like the Redskins would have to abandon the running game and go to the air with the Seahawks continuing to apply pressure to Grossman. Instead, Grossman led the Redskins in scoring 16 in the fourth quarter for a 23-17 win. So many things went wrong from bad passes and dropped passes to missed tackles and penalties, it left many wondering exactly what the biggest issue was with the team at the moment. As with the last couple match ups, penalties were an issue for the Seahawks, but this time it cost the team the game. There were a few in particular that stood out. One was a defensive holding call by Brandon Browner allowed the Redskins first drive to continue on to their first touchdown. In the third quarter, K.J. Wright was called on a roughing the passer call that would have dramatically affected the field position for the Seahawks. And the final touchdown by the Redskins was scored on a third-and-20 pass to the end zone. Browner was called for interference, but Anthony Armstrong came down with the 50-yard touchdown catch regardless. It wasn’t all bad for Browner, he did intercept a Grossman pass that led to the Seahawks first touchdown. He returned the ball to the 20-yard line and on their first play, Jackson dropped it off to Marshawn Lynch who scored a touchdown for the seventh consecutive game. 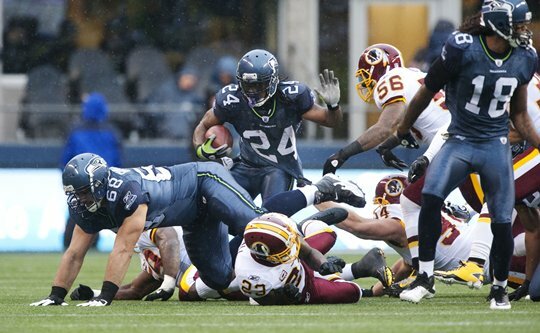 Lynch also had his third-straight 100-yard rushing game. Another bright spot in the game was big Red Bryant. The guy needs to be fitted for a straight jacked, because the dude is flat out insane. After already blocking two field goals this year, he blocked a 23-yard field goal as well as an extra point this week. Win the game and there are other highlights that stand out, but those moments were overshadowed by the frequent penalties. The Seahawks offense was flagged on nearly ever drive in the fourth quarter. Addressing those issues appear to be the focus of the coaching staff moving ahead. Coach Carroll put a lot of the blame on himself. He said it may even come down to benching guys to help get the message across. It’s tough to know what the impact for how particular penalties will impact the game, however, the game seemed to pivot around a penalty on Golden Tate’s touchdown celebration. In celebrating the score after going up 17-7, Tate fell to his back and was flagged by the officials. Even though special teams covered Tate by doing a great job on coverage on the ensuing kickoff, the Redskins quickly drove the length of the field. Remember the good-old days of last week? You know, when fans were talking about how the Seahawks had an opportunity to run the table and finish the season in the playoff hunt. Well they aren’t mathematically out at this point, but the chances look much more slim. After a home win against the Ravens and a convincing road win against St. Louis, this game against the Redskins was supposed to be in the bag for the Seahawks. It was going to be the centerpiece of a five game winning streak with two more games left to play at home against losing teams. As fans, I suppose we got ahead of ourselves, but I still have faith that things are moving in the right direction. Personally, I don’t understand why I continue to hear about not having a quarterback of the future. Yes, Jackson made his fair share of bad decision during the game, but there’s nothing the team can do about it right now. We either have to wait and see what the team does with the draft, or through free agency in the offseason. Even if the Seahawks draft a quarterback, I would expect to see Jackson taking snaps well into next season. So I’m rooting for him until he’s no longer wearing Seahawks blue, especially since he’s proven to be the best option for the team at the moment. I say that because I wouldn’t be surprised if he couldn’t go on Thursday. He’s got an amazing amount of toughness, but he got beat up pretty bad this game. The loss leaves the Seahawks in second place, but the Cardinals win over the Rams this weekend has both teams at 4-7. Seattle has a short week to prepare for the Eagles who come into town with a 4-7 record of their own after losing 38-20 to the Patriots. Coach Reid and the Eagles may feel more welcome on road turf this week after hearing chants of “Fire Andy!” during their latest loss. My hope is that the Seahawks can help add some fuel to that fire before sending the “Dream Team” back to Philadelphia.